Further information on options is available in the Rewiring Tips article. This article cannot practically cover everything. The writing of this article may be incomplete when you read it. Laws and regulations change over time. Unexpected situations may change the specific requirements for some circuits. For these reasons and more, one should not carry out safety critical work based solely on wiki content. Information and plans should be independently checked and verified before action. Anyone installing wiring should also understand some basic safety issues not discussed here. This article is an introductory overview rather than a complete A to Z on rewiring, and assumes some basic electrical knowledge. Some regulatory requirements are mentioned in this article. These apply to new wiring, and in many cases are not requirements for existing wiring. The Electrical Glossary may be useful. Ring circuits from 32A MCBs in the CU supplying mains sockets. 2 such rings is typical for a 2 up 2 down, larger houses have more. Radial lighting circuits from 6A CU MCBs. 2 or more circuits typical. Earth connection from incomer to CU. Outdoor lighting supplied by a 6A MCB, often via a PIR motion detector switch. 16A MCB and cable supplying hot water immersion heater. AEI Storage heater switch with separate supplies for (unfused) off-peak supply on dedicated radial circuit and (fused) boost/fan supply on the socket circuit. A high current MCB supplying storage heaters. Sometimes these are run from the main CU, but often from a timeswitch controlled dedicated CU (with either a separate "off peak" electricity meter, or a dual tariff meter). Junction box loop in, where the termination and feed connection are done at junction boxes, and cables run to switches and lamps from there. A main isolating switch. This switches off everything. A fuse or MCB for each circuit. This cuts the power to the circuit in the event of high fault current. Each fuse or MCB supplies one circuit only. One circuit may supply anything from 1 to a large number of loads. Split load CUs have become popular in recent years, and ubiquitous since 2008 with the introduction of the 17th edition of the wiring regs. They usually offer significant advantages over the traditional unsplit CU type. See 17th Edition Consumer Units for more details. A split load CU divides the MCBs into 2 or more separate banks. Each bank usually having its own RCD. There should also be a master switch that will switch the whole CU. Some wiring work can be carried out with just a section of a CU turned off, perhaps retaining access to light and power while working. The split load arrangement means both RCDed and non RCDed loads can be supplied from the one CU. Split load CUs are recommended, and this article will assume the use of a split load CU. Earthing is a fundamental safety system used in electrical installations. It works in co-ordination with circuit breakers MCBs, Fuses, and RCDs to ensure that an electrical supply can be disconnected quickly in the event of a fault. This greatly reduces shock risk. Most houses have an earth connection supplied by the electricity supplier. Those that don't (generally country houses several miles from the nearest town), use a local earth rod instead. The supplier's earthing terminal or your own earth rod is connected to the CU earth block. Each electrical circuit in the house takes its earth connection from the CU earthing block. The 17th Edition of the wiring regulations impose more frequent requirements to install RCD (or RCBO) protection than the previous 16th Edition. In general, ANY cable which is buried less than 50mm below a wall's surface AND is NOT mechanically protected, or wired in one of a number of specialised cable types that incorporate an earthed screen must have 30mA trip RCD protection. Such circuit protection may be derived from either an RCD protecting several circuits, or individual RCD/RCBOs on each circuit. RCDs reduce the risks of injury from electric shock (they don't eliminate it completely), however they can also introduce reliability and issues of their own if not used in an appropriate way. Historically RCDs were usually only used on some circuits rather than all. With a supplier provided earth connection, the most common historical arrangement was a split CU with a RCD on one side, and no RCD on the other. Generally the RCD side is used to supply sockets and shower, with most other items on the non-RCD side. With a local earth rod, the situation is different in that all circuits must be RCD protected, since a local earth rod is not usually a sufficiently good earth on its own to clear all earth faults. So RCDs are used on all circuits even in older installations. A common option is to have the supply fed through a 100mA time delayed RCD, the output of which goes to a split CU with RCD on one side. This is not an ideal arrangement, as a large earth leakage fault on the non-RCD side will cause complete power failure, and sometimes inability to reset the power. An RCBO is a combined RCD and MCB in one module, and is fitted in place of an MCB. RCBOs allow individual circuits to be protected by their own RCD without any risk that a fault in an unrelated circuit could cause it to trip. However protecting all circuits like this is more expensive. Where RCBOs are used, they are fitted in the non-RCD side of the CU, and supply circuits needing RCD protection. See 17th Edition Consumer Units for details. Neutrals for circuits protected by different RCDs (or those from an RCD and non RCD protected circuit) must not be mixed. If any neutral wire is connected to the wrong side, the RCD will trip. 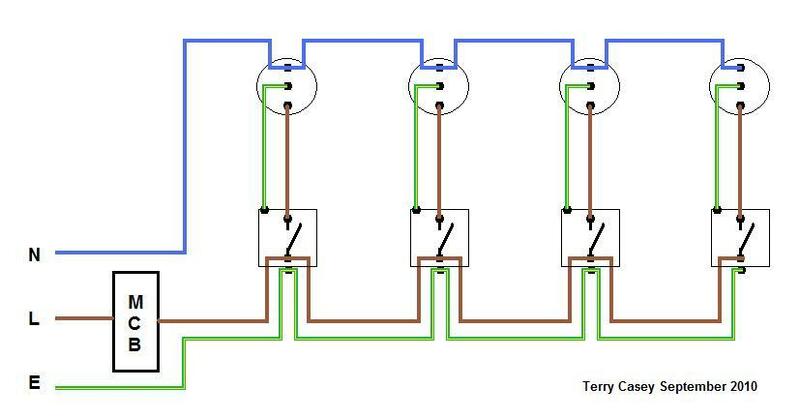 The same principle is true for RCBOs, each RCBOed circuit needs to have its neutral connected to the RCBO neutral and not elsewhere. All socket circuits, should have RCD protection since Plug-in are the source of almost all electrocutions. Modern installations will typically provide additional RCDs so that vulnerable circuits (i.e. lighting) are unlikely to be affected by a nuisance trip, and so that circuit types prone to high earth leakage (e.g. things with heater elements and water in close proximity) are separately protected from others. Sockets may be wired on ring circuits or radial circuits. Mostly rings are used, as they use less copper for most circuit layouts, they have safety advantages over radial circuits (sometimes debated), can provide more power, and cover more floor area per circuit. Sockets are on 32A ring circuits in most house installations. These use a ring of cable (ie a loop), so that at the CU 2 cables are connected to the MCB instead of 1. An unlimited number of sockets may be connected on each ring. One ring circuit per floor is a fairly common arrangement, but by no means the only option. Larger houses generally have more rings. Its also common to have a ring dedicated just for sockets in the kitchen since that is where you will find many of the highest power consuming appliances in a modern house. 2.5mm² cable is usually used for ring circuits. 4mm² is used when cable will be under insulation or bunched with other cables. Spurs are permitted, but sockets should be included in the ring rather than spurred wherever practical. Spurring is best only used for later additions to circuits. Rules apply to the loading and number of sockets allowed on the end of a spur. Spurring sockets prevents the easy later addition of more sockets in some positions, as a spur may not be spurred off a spur. Spurs also prevent the addition of more sockets at existing spurred positions, whereas a practically unlimited number of sockets can be added where a socket is in the ring. Bear in mind the number of sockets wanted has risen greatly over the years, and can only be expected to rise further. 20A radials use 2.5mm² or 4mm² cable. Minimum and desirable numbers of sockets recommended per room are given. Recommended numbers are inevitably a matter of opinion, and are only recommended as a starting point for consideration. Recommended: 2x double sockets at each of 4 locations (in or near corners) + a double socket at side of single bed, or a double socket at each side of double bed. 2 way lighting switches controllable at door & bedside. Recommended: 1 double socket for a short corridor, 2 or possibly more in a long one. Put one where a hall table might go. Recommended: Under worktop: 4 or 5 double sockets. Over worktop: 1 double socket per 2 metres. All sockets on ring circuit, no spurs. 2A or 5A sockets on lighting circuit: one above each set of cupboards, one below each set of cupboards, one away from cupboards & worktop. Recommended: 2x double sockets at each of 4 locations (in or near corners) + 1-3 double sockets where PC or AV equipment is to be used. If the room has 2 or more doors, 2 way lighting switches controllable at each door. 4-6x 2A or 5A sockets on lighting circuit. Recommended: none. 1 socket somewhere out of easy reach in zone 3 if you wish to use an appliance in the bathroom (eg washing machine or dehumidifier). A shaver socket at the sink is an option, but plugging items in outside the room is probably better practice. Recommended: 2x double sockets at each of 4 locations (generally near corners), plus anything from 2 to 6 double sockets where computer or other business appliances will go. Recommended: if far from the house, a double socket can be useful. If you'll spend time in it, a light too. Recommended: plenty of lighting & sockets according to size & proposed use. Given the tendency for electricity use to rise over the years, an overrated feed cable may prove useful in time. Recommended: A splashproof double socket above head height can be handy. For a dedicated horticulturalist, fluorescent lighting, a couple of splashproof double sockets positioned at head height or above, and a 13A socket for discharge lighting can all come in useful. Radial circuits are used for lighting. There is one lighting circuit on each lighting MCB. Lighting circuits are usually on a 6A MCB or 5A fuse, though 10A can be used (with some extra restrictions (now removed in the 17th edition of the wiring regs)) for large circuits. However if the area served is large, more 5A or 6A circuits would in most cases be preferable. lighting circuits are typically wired in 1mm² or 1.5mm² T&E cable (1.5mm² allows a longer cable run, before suffering too much voltage drop). The power feed cable may go to either the switch or the bulbholder. If it goes to the bulbholder, this is called loop-in wiring, and the ceiling rose (a junction box with a downward facing cable outlet) then uses four sets of connections instead of 3, the extra one being a switched live. With loop-in wiring, the cable from the ceiling rose to the switch has 3 conductors, namely earth, unswitched live and switched live. Regs conformance requires that brown sleeving be fitted over the neutral coloured conductor at each end of the switch cable since it is being used as a live. All cable colours are as expected except for the switched live. Light switches are usually wired with standard T&E, which means the switched live wire will be black (existing installs) or blue (new installs) - this should be marked with live coloured tape or sleeving (though alas this is often missing). So beware, if you take down a rose without paying attention to which wire is which, and you re-connect all the blacks or blues together, your fuse or MCB will trip. A less commonly met system of wiring lighting circuits. The permanent lives and switched lives of the circuit use the single core and earth cable (type 6241Y). This run starts from the MCB and loops between the lightswitches to provide a permanent live and earth to the lightswitches. Another length of 6241Y is then used from the lightswitch to the light fitting to provide a switched live and earth at the light fitting. The neutral cable is a double sheathed cable (6181Y with a blue inner sheath) that runs from the CU neutral busbar and from light fitting to light fitting (there will only be one neutral at the end of the circuit). It makes it easier to put light fittings up as there are less cables to mess with at the fitting. Two way switching means having two or more switches in different locations to control one lamp. They are wired so that operation of either switch will control the light(s). In some older properties (typically wired in or before the mid 1960s), its not uncommon to find lighting circuits without an earth wire. Care should be taken if you have such a circuit to ensure that only appropriate light fittings and switches are used. Most metal light fittings and switches will require earthing, but those marked with the double insulated symbol do not need an earth connection. Most plastic switches and light fittings are also safe for use on circuits with no earth. Note the earth wire in the T&E must be run to all switches, junction boxes & light fittings, including those that are currently plastic. It is not permitted to borrow an earth from another circuit. Ideally the non-earthed circuit ought to be re-wired, or at least have a RCD installed to protect it. Outdoor lighting is usually run on its own radial circuit off its own MCB in the CU. Usually this is a 6A MCB, but lighting is less likely to cause problems if run on a 5A fuse. Exterior cabling must be appropriate for use outside (many cable types degrade under prolonged exposure to sunlight for example). Bathrooms (or rooms with showers) are "special locations" in the language of the wiring regulations. This is because they are places where people are particularly vulnerable to serious injury from electric shock (due to being wet and barefoot). In modern designs all bathroom electrics are supplied by RCD protected circuits. Bathrooms are divided into 3 zones, with different rules for each zone. Electrical fittings in the bathroom in zone 0 must conform to IPX7 or better, and must be of an extra low voltage type. Electrical fittings in the bathroom in zones 1 & 2 must conform to IPX4 or better. Electrical fittings in the bathroom outside of the zones do not need to confirm to any specific IP rating, but must be appropriate for the circumstance in which they are used. There are also limitations to the type of electrical equipment permitted in each zone. See the Bathroom electrics article for more details. All metal items that enter a bathroom from outside of the room (e.g. copper pipes, electric circuit cables) are connected together using 4mm² green/yellow insulated wire. Connection is also made to each of the protective earth wires in each circuit that feeds an appliance in the bathroom (e.g. lamps, heaters, towel rails etc). This is called equipotential bonding and is designed to minimise exposure to dangerous voltages that may be present during electrical fault conditions. The wire is connected to metal pipes using BS 951 earth clamps. The wire is connected to radiators using connectors. It is permitted to place equipotential bonding connections immediately outside the bathroom if necessary. Note equipotential bonding can be omitted if all the circuits that enter the bathroom are protected by RCD(s) with trip thresholds of 30mA or less. Until the introduction of the 17th edition of the wiring regulation, sockets were not permitted in a bathroom at all, unless they were either a transformer isolated shaver socket, or sockets to power extra low voltage devices, both of which are permitted in Zone 2 or outside. For more information on bathroom electrics, see Bathroom electrics. Modern kitchens often have a high concentration of electric appliances, many of them high power consumption devices. Hence they are worthy of special mention. All in one electric cookers (oven, hob & grill in one unit) are fed by a high current cable from the CU, typically on a 32A MCB. Single cavity ovens with no hob are more often put on a 13A plug. Most hobs require their own high current feed, but some are available that incorporate load limiting switching, and are designed to be run on a 13A plug. 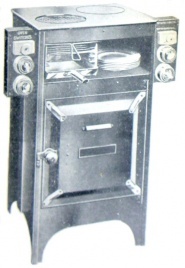 Combi cookers (microwave & fan oven, with or without grill) are always on a 13A plug. Contrary to popular belief kitchens do not need equipotential bonding. Most kitchens are supplied by one ring circuit. However this may be insufficient for large or all-electric kitchens. This page was last modified on 30 January 2019, at 18:26. This page has been accessed 2,259,618 times.